There hasn’t been much reason to pay attention to the Houston Astros over the last few seasons. They have remained near the bottom of the standings, and have mostly filled out their roster with young, unproven players. While significant help appears to be on the horizon in their farm system, the current crop of major leaguers playing for the Astros has been nothing to write home about. However, so far in 2014, there has been one very notable exception to that rule. Jose Altuve, originally known mostly for his small stature, is surprising everyone by leading the league in hitting as well as stolen bases. He was selected for the All-Star team this season, and appears to be the first piece of the puzzle for a rebuilding Astros squad. With Altuve already in place as a blossoming star, the Astros can work on filling in the pieces around their second baseman to put together a contending team. Altuve is listed at a height of 5’6’’, but even that seems like it might be a little bit generous. He is among the shortest players to ever reach the major leagues, yet that hasn’t stopped him from becoming a challenging opponent to face. Not surprisingly, he has only hit 18 homeruns in his 4-year major league career, but has already produced more than 100 doubles – thanks in large part to his speed. That speed, along with talent running the bases, has allowed him steal over 40 bases so far this season, before the month of July is even over. 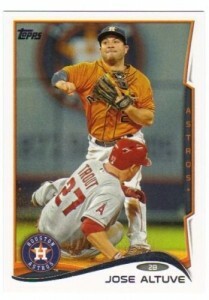 Just 24 years old, Altuve seems to be positioned well to remain at the top of his game for many years to come. For baseball collectors, adding some pieces that represent this young man’s growing career would be a wise choice – especially considering how unique it is to have someone of such short stature doing big things in a game dominated by men six feet and above. His size makes him a crowd favorite, as does the exciting way in which he plays the game. It is not hard to envision the Astros returning to near the top of the standings with Altuve leading the way in the leadoff spot in the order. If they are able to assemble some more young hitters behind him – such as George Springer and Jonathan Singleton – brighter days might not be far off. The Astros are considered to have one of the better farm systems in all of baseball, thanks in large part to all of the high draft picks they have had in recent years. As long as those players develop on schedule through the minor leagues, the Astros could very well be a force to be reckoned with in the very near future.